© Nazar et al. ; Licensee Bentham Open. This unique postal survey was setup to assess the agreement on treatment options in displaced distal radius fractures and whether or not there existed a consensus amongst the surgeons contacted. With this in view we contacted 244 surgeons and 166 completed answers were received. 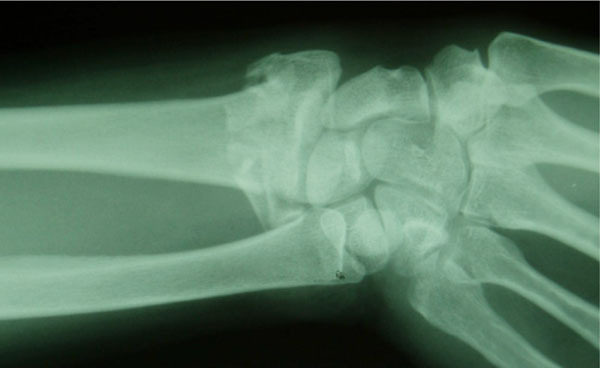 We chose two common examples of displaced distal radius fractures. Case one was a 38 year old teacher with a closed, displaced extra-articular fracture (Frykman type II) of her left non-dominant hand and case two was a 42 year old carer, with a closed, displaced intra-articular fracture (Frykman type VII) of her right dominant wrist. There was a questionnaire included with these radiographs. 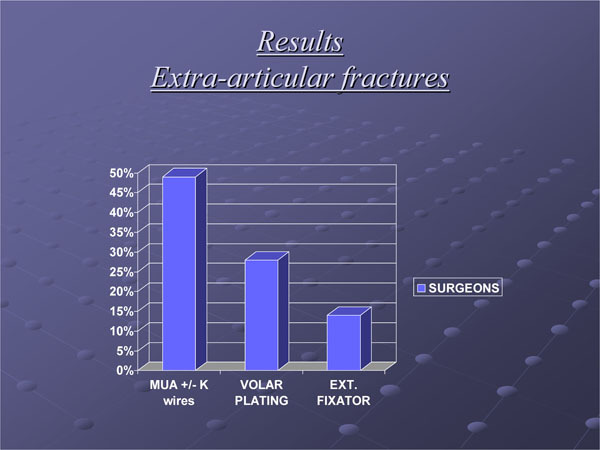 In the first case, 82 (49%) surgeons favoured MUA + K-wiring, 47 (28%) favoured volar plating and 14 (8%) an external fixator. In the second case, 28 (17%) surgeons favoured MUA + K-wiring, 53 (32%) advocated volar plating and 33 (20%) an external fixator. Furthermore surgeons with specialist Upper limb interest were more likely to apply a volar plate (63% in either case) whilst the surgeons with general or other areas of expertise (18% in first case and 23% for second case). In conclusion there is no consensus among the Orthopaedic surgeons in treating displaced distal radial fractures. A multicentered randomized clinical trial would help elucidate the best treatment options. Displaced distal radius fractures are very common injuries and present regularly to all orthopaedic surgeons. In the UK, the one-year incidence of fractures of the distal radius is 9 per 10,000 men and 37 per 10,000 women. Several documented treatment modalities for these fractures have been described with a recent trend for internal fixation with volar plating . However, the literature suggests that there is still no consensus as to the best treatment of these injuries . We set out to find what the current consensus is amongst orthopaedic surgeons in the Northwest of England with respect to treatment of displaced distal radius fractures. A questionnaire was sent out to all consultant orthopaedic surgeons practicing in the Northwest of England. 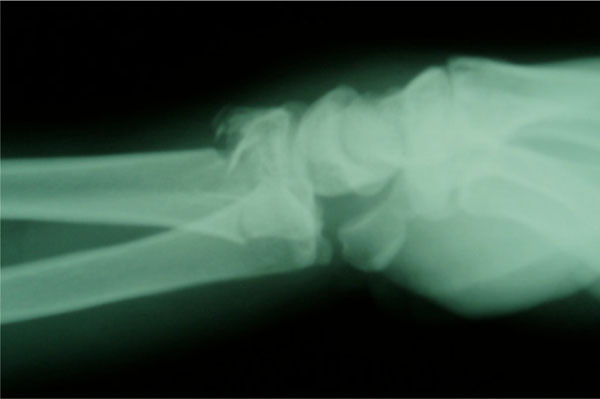 Anteroposterior and lateral radiographic images of two cases of displaced distal radius fractures (one extraarticular and the other intraarticular) were provided along with a short history. A list of the common modalities of treatment was given. Each surgeon was asked to indicate their ideal method of management of each of these cases. 244 questionnaires were sent out and a completed form was received from 166 (69%) of surgeons. A 38 year old teacher with a closed, displaced extra-articular fracture (Frykman type II ) of her left non-dominant hand (Figs. 1, 2). 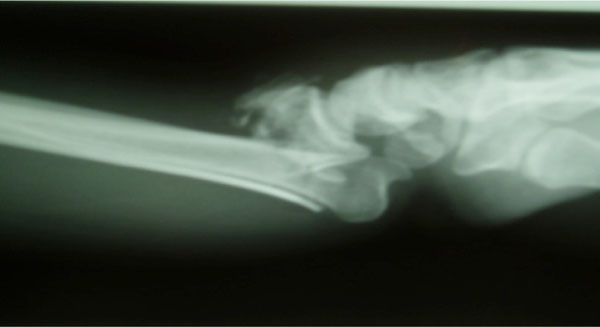 Case 1, x-ray distal radius Lateral view. Case 1, x-ray distal radius AP view. A 42 year old carer, with a closed, displaced intraarticular fracture (Frykman type VII) of her right dominant (Figs. 3, 4). Case 2, x-ray distal radius Lateral view. Case 2, x-ray distal radius AP view. The results again indicated a wide variety of opinion as to the best way to manage these two cases. The most popular methods of treatment were MUA + K-wiring, volar plating and application of an external fixator. 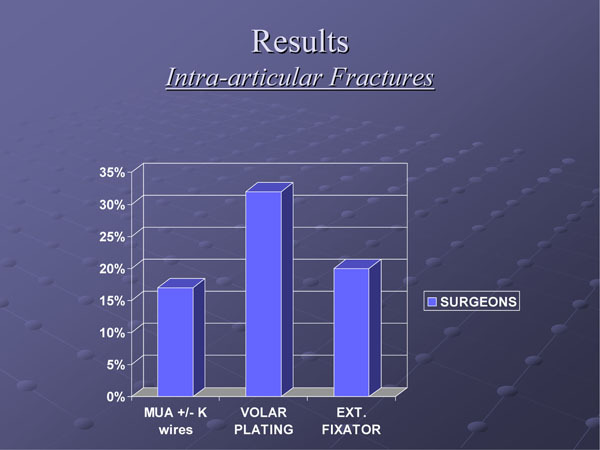 In the extraarticular fracture, 82 (49%) surgeons favoured MUA + K-wiring, 47 (28%) favoured volar plating and 14 (8%) an external fixator (Fig. 5). In the intraarticular case, 28 (17%) surgeons favoured MUA + K-wiring, 53 (32%) advocated volar plating and 33 (20%) an external fixator (Fig. 6). Upper limb surgeons were more likely to treat with volar plating (63% in each case) than non upper limb surgeons (18% and 23% for each case) (Fig. 7). Graph showing treatment suggested by the surgeons for case 1. Graph showing treatment suggested by the surgeons for case 2. 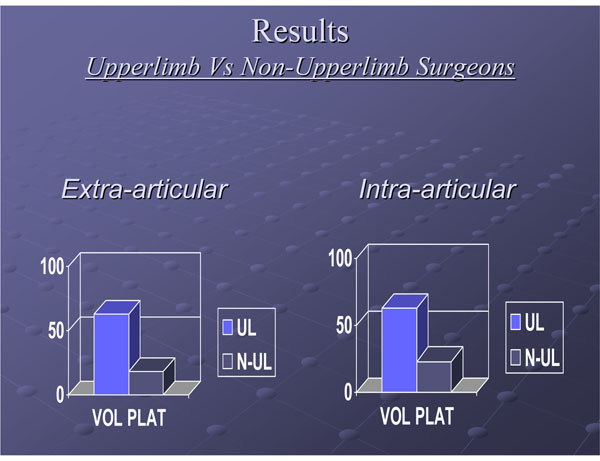 Graph showing comparison of upper limb versus non-upper limb specialists in favour of volar plating. The treatment of distal radius fractures has been at the forefront of Orthopedics literature due to rapidly changing treatment options. It is one of the commonest fractures with more than 70,000 patients attending hospitals requiring treatment every year in the UK. According to the most recent Cochrane review on closed reduction methods for treating distal radius fractures there is insufficient evidence from comparisons tested within randomized trials to establish the relative effectiveness of different methods of closed reduction used in the treatment of displaced distal radius fractures . Mal-union is a recognized complication of closed reduction of distal radius fractures in low-demand elderly patients and occurs in nearly 90% of patients . We undertook this survey as there is still no consensus and recent advent of volar locking plates has changed the accepted methods of treating these injuries in Orthopaedics departments. Manipulation under anaesthesia and fixation of distal radius fractures with Kirschner wires is also a recognized treatment method. Complications related to this procedure are pin-track or k-wire infection, migration and damage to tendons and nerves especially superficial branch of radial nerve has been found to be 20% . Application of Kapandji procedure with k-wires at a smaller angle to the axis of the radius results in the highest primary stability . The comparison of external fixation versus conservative treatment there is sufficient evidence to support that external fixation gives improved anatomical results and reduces re-displacement however there is insufficient evidence to confirm a better functional outcome . There are two external fixation methods for treatment of distal radius fractures, bridging and non-bridging. Studies have shown that non-bridging external fixation of the distal radius is a better technique compared to bridging external fixation as it reduces the risk of dorsal mal-union. Rehabilitation is faster with non-bridging external fixation and the patients show better grip strength and flexion [8, 9]. One major problem with external fixation is that it leads to joint stiffness. The outcome is usually poor unless the method is augmented with percutaneous wires to allow optimal fracture stabilization with physiological alignment of the wrist . McQueen et al. compared four different treatments for distal radius fractures in a prospective randomized trial on 120 patients with re-displaced fractures of distal radius. The four treatments were manipulation with plaster, open reduction and bone grafting and closed external fixation with and without mobilization of the wrist at three weeks. They found that the best anatomical results were obtained by open reduction and bone grafting followed by external fixation with or without early mobilization of the wrist however there was no difference in functional outcome of these patients treated by four different methods . Volar locking plates were not assessed in this study. There is still a dearth of prospective randomized trials in this area. Before the advent of volar locking plates the randomized trials for surgical interventions for distal radius fractures show some evidence to support the use of external fixation or percutaneous pinning however their precise role and methods are not established and whether this will produce consistently better long-term outcome is also not clear . The advent of volar locking plates have extended the indications to older population as failure rates are low they provide better hold even in osteoporotic bone. In younger population it allows early mobilization and return to work. A comparative outcome study using volar locking plating system for distal radius fractures showed that it is successful in managing distal radius fractures in older patients with comparable outcomes to younger patients . There does not seem to be a consensus among the orthopedic surgeons in treating displaced distal radial fractures. Surgeons with a declared interest in upper limb surgery are three times more prone to use volar plating than any others as a preferred method of treatment. Is technology the answer to the treatment of distal radius fractures? A multi-centered randomized clinical trial would help elucidate which treatment is best for these common injuries. Wright TW, Horodyski M, Smith DW. Functional outcome of unstable distal radius fractures: ORIF with a volar fixed-angle tine plate versus external fixation J Hand Surg Am 2005; 30(2): 289-99. Harley BJ, Scharfenberger A, Beaupre LA, Jomha N, Weber DW. Augmented external fixation versus percutaneous pinning and casting for unstable fractures of the distal radius-a prospective randomized trial J Hand Surg Am 2004; 29(5): 815-24. Handoll HH, Madhok R. Closed reduction methods for treating distal radial fractures in adults Cochrane Database Syst Rev 2003; 1: CD003763. Beumer A, McQueen MM. Fractures of the distal radius in low-demand elderly patients: Closed reduction of no value in 53 of 60 wrists Acta Orthop Scan 2003; 74(1): 98-100. Singh S, Trikha P, Twyman R. Superficial radial nerve damage due to Krischner wiring of the radius Injury 2006; 37(1): 96-7. 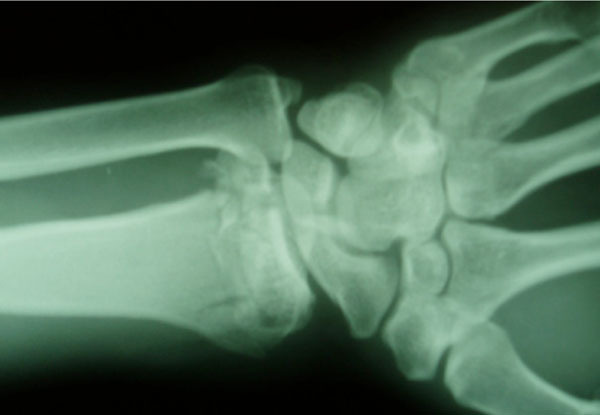 Mittlemeier W, Braun C, Schafer R. The Kapandji technique for fixation of distal radius fractures-a biomechanical comparison of primary stability Arch Orthop Trauma Surg 2001; 121(3): 135-8. Handoll HH, Huntley JS, Madhok R. External fixation versus conservative treatment for distal radial fractures in adults Cochrane Database Syst Rev 2007; 3: CD006194. Hayes AJ, Duffy PJ, McQueen MM. Bridging and non-bridging external fixation in the treatment of unstable fractures of the distal radius: A retrospective study of 588 patients Acta Orthop 2008; 79(4): 540-7. McQueen MM. Redisplaced unstable fractures of the distal radius. A randomized prospective study of bridging versus non-bridging external fixation J Bone Joint Surg Br 1998; 80(4): 665-9. Capo JT, Swan KG Jr, Tan V. External fixation techniques for distal radius fracture Clin Orthop Relat Res 2006; 445(4): 30-41. McQueen MM, Hajducka C, Court-Brown CM. Redisplaced unstable fractures of the distal radius: A prospective randomized comparison of four methods of treatment J Bone Joint Surg Br 1996; 78(3): 404-9. Handoll HH, Madhok R. Surgical interventions for treating distal radial fractures in adults Cochrane Database Syst Rev 2003; 3: CD003209. Chung KC, Squitieri L, Kim HM. Comparative outcomes study using the volar locking plating system for distal radius fractures in both young adults and adults older than 60 years J Hand Surg Am 2008; 33(6): 809-19.